Vacam PoE Switch supports data and power transmission through CAT.5 cables at the same time. And 4+2 port support fast connecting at 10/100Mbps. It also supports long transmission distance at 250 meters both for power and data, therefore, it saves cost for the project that requiring long distance transmission through extender, fiber and coaxial cable etc. It reduces line losses effectively though 4-core cable supplying power at the same time. Cost effective Vacam PoE Switch provide a simple network for wireless AP, business and home that are based on the installation of IP Camera. These devices away from electrical outlets are very suitable for hanging on the wall or ceiling. PoE eliminates the hassle for these devices, specially the electrical outlets. Connect the AC power connection to make those difficult device more flexible, and the installation cost minimization. - 6x 10/100M copper RJ45 Ports (All ports support MDI/MDIX auto sensing). 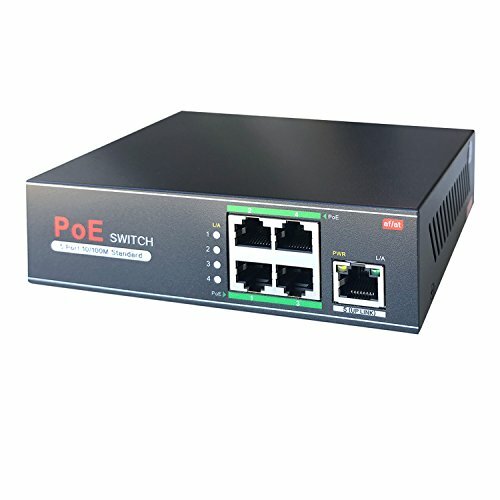 - Port 1-4: PoE port, max PoE output for each port is 30W. - Transmission Distance: 250 Meters @10M, 100 Meters @ 100M. Supply power to wireless AP and IP Camera through CAT 5 cable. 1-6 Port: 10/100M auto sensing RJ45 port. Support port auto-flip (Auto MDI/ MDIX). Switch Mode: Mode 1: Port 1-6: 10/100M auto-sensing. @100 meters; Mode 2: Port 1-4: 10M @ 250 meters; Port 5-6: 100M @ 100 meters. Anti-thunder function for uplink port (Port 5-6 anti-thunder function reaches level 2). Support long transmission distance at 250 meters. Total PoE Power: 60W (Port 1 - 4), Max PoE power output is 30W. Store and forward, fanless design, natural cooling, mini size. If you have any questions about this product by Vacam, contact us by completing and submitting the form below. If you are looking for a specif part number, please include it with your message.